This method allows you to manually enter the content you wish to publish to your social channels. With just a few clicks, AscendSocial uniquely allows you to import any article (complete with featured image) from any of your ‘linked’ WordPress blogs directly into your dashboard. With just a few clicks, Article Creator allows you to instantly create tip based articles which you can optionally customize before publishing to your social channels. 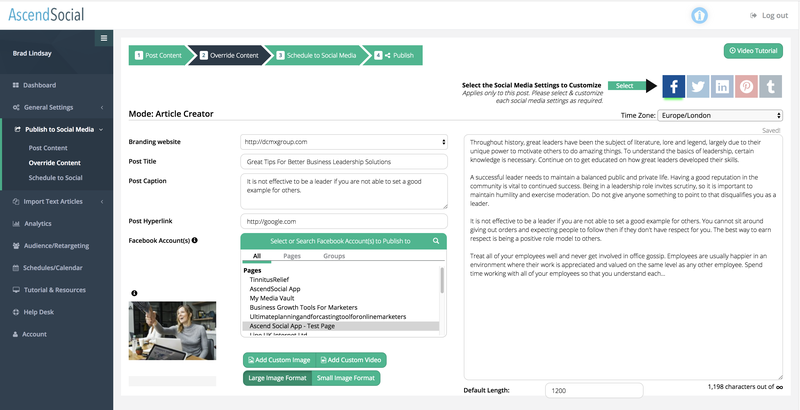 Whichever method is used to enter your content, AscendSocial’s Override Content section allows you to optionally tailor and fine tune your content separately for each social channel before simultaneously publishing your content to your social channels. For example, with the limit on Twitter of 280 characters, you will likely want to tweak the content which will appear over those 280 characters! Benefits That Are Not Just Skin Deep! The benefits to your business is that with just a few mouse clicks AscendSocial allows you to place enticing teaser content in front of your social media viewers who are then able to click through directly to the article on your website. And of course your readers are then being exposed to the other valuable content and marketing material on your website. An important and significant side benefit to your business is that visitors are now spending more time on your site, potentially boosting of your search engine ranking!